PETERSHAM, Mass. — In a towering forest of centuries-old eastern hemlocks, it’s easy to miss one of the tree’s nemeses. 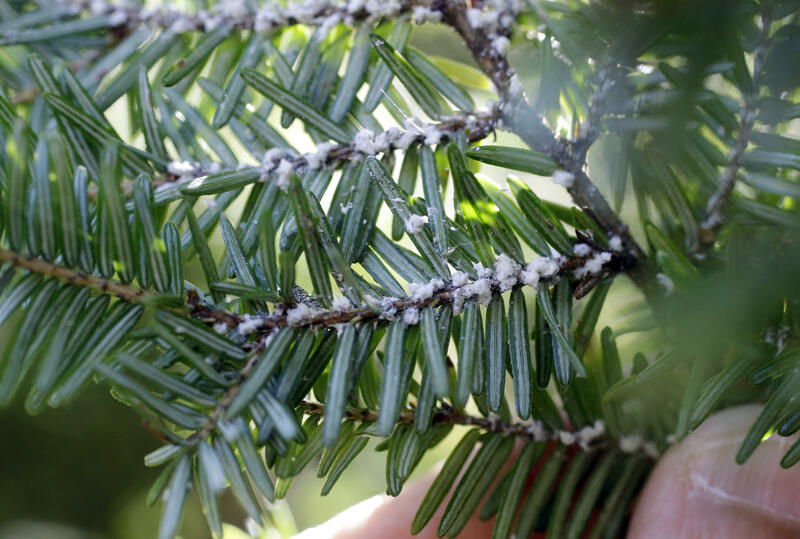 No larger than a speck of pepper, the Hemlock woolly adelgid spends its life on the underside of needles sucking sap, eventually killing the tree. The bug is one in an expanding army of insects draining the life out of forests from New England to the West Coast. Aided by global trade, a warming climate and drought-weakened trees, the invaders have become one of the greatest threats to biodiversity in the United States. Scientists say they already are driving some tree species toward extinction and are causing billions of dollars a year in damage — and the situation is expected to worsen. “They are one of the few things that can actually eliminate a forest tree species in pretty short order — within years,” said Harvard University ecologist David Orwig as he walked past dead hemlocks scattered across the university’s 5.8-square-mile research forest in Petersham. This scourge is projected to put 63 percent of the country’s forest at risk through 2027 and carries a cost of several billion dollars annually in dead tree removal, declining property values and timber industry losses, according to a peer-reviewed study this year in Ecological Applications. That examination, by more than a dozen experts, found that hundreds of pests have invaded the nation’s forests, and that the emerald ash borer alone has the potential to cause $12.7 billion in damage by 2020. Insect pests, some native and others from as far away as Asia, can undermine forest ecosystems. For example, scientists say, several species of hemlock and almost 20 species of ash could nearly go extinct in the coming decades. Such destruction would do away with a critical sponge to capture greenhouse gas emissions, shelter for birds and insects and food sources for bears and other animals. Dead forests also can increase the danger of catastrophic wildfires. Today’s connected world enables foreign invaders to cross oceans in packing materials or on garden plants, and then reach American forests. Once here, they have rapidly expanded their ranges. While all 50 states have been attacked by pests, experts say forests in the Northeast, California, Colorado and parts of the Midwest, North Carolina and Florida are especially at risk. Forests in some states, like New York, are close to major trade routes, while others, like in Florida, house trees especially susceptible to pests. Others, like New Hampshire, Massachusetts and Maine, are experiencing record warming. The emerald ash borer, first found in 2002 in Michigan, is now in 30 states and has killed hundreds of millions of ash trees. The gypsy moth, discovered in 1869 in Boston, is now found in 20 states and has reached the northern Great Lakes, according to the U.S. Department of Agriculture. Native bark beetles have taken advantage of warming conditions and a long western drought to rapidly range from Mexico into Canada. An outbreak in Colorado spread across 3.4 million acres of forest from 1996 to 2013, according to the Forest Service, and in California 100 million-plus trees have died in the Sierra Nevada since 2010. Though small, bugs can easily overwhelm big trees with sheer numbers. Forest pests in the era of climate change are especially concerning for timberland owners, said Jasen Stock, executive director of the New Hampshire Timberland Owners Association. Urban forests, too, are at risk from outbreaks. In Worcester, Massachusetts, a city of about 180,000, an Asian longhorned beetle infestation in 2008 resulted in the removal of 31,000 trees. “You would leave for work with a tree-lined street, and you come back and there was not a tree in sight,” recalled Ruth Seward, executive director of the nonprofit Worcester Tree Initiative. Most trees have since been replaced. Though trees can die off quickly, the impact of pests on a forest ecosystem can take decades to play out. Dead hemlocks, for example, are giving way to black birch and other hardwoods. Gone are favorite nesting spots for two types of warblers, as well as the bark that red squirrels love to eat, Harvard’s Orwig said. The birds won’t die off, he said, but their ranges will be restricted. “It’s a great example of how one species can make a difference in the forest,” Orwig said. As pests proliferate, scientists seek to contain them. Among the methods are bio controls, in which bugs that feed upon pests in their native lands are introduced here. Of the 30 states with emerald ash borer outbreaks, the USDA says 24 have released wasp species to combat them. Some scientists worry about introducing another pest; others complain they aren’t effective because they can’t eat enough of the fast-breeding pests to make a difference. “With all bio controls, the hope is to create balance — balance between predator and prey,” said Ken Gooch, forest health program director for the Massachusetts Department of Conservation and Recreation. Genetic modifications also offer promise. On a research farm in Syracuse, New York, are rows of 10-foot chestnut trees tweaked with a wheat gene to make them resistant to chestnut blight, a fungus that came from Japan more than a century ago and killed millions of trees. Genetic engineering could likewise be applied to fight insects, said William Powell, a State University of New York College of Environmental Science and Forestry professor directing the chestnut research. An alternative strategy, also a slow one, is to plant trees 50 or 100 miles away from their normal range so they can escape pests, or adapt to a more favorable climate, said Steven Strauss, a professor of forest biotechnology at Oregon State University. To stop the next pest from entering the country, researchers like Gary M. Lovett, of the Cary Institute of Ecosystem Studies in New York, propose measures such as switching from solid wood shipping material that can harbor insects and restricting shrub and tree imports.